One lucky Only WDWorld Reader will win two Disneynature Books related to the new African Cats Movie premiering on Friday April 22nd at theaters near you. "Sita The Cheetah" and "A Lion's Pride" can be yours! Read on to learn more about this inspiring film and how you can win! Win a pair of African Cats books: Sita the Cheetah & A Lion’s Pride! An epic true story set against the backdrop of one of the wildest places on Earth, “African Cats” captures the real-life love, humor and determination of the majestic kings of the Savanna. Narrated by Oscar®-nominated actor Samuel L. Jackson, the story features Mara, an endearing lion cub who strives to grow up with her mother’s strength, spirit and wisdom; Sita, a fearless cheetah and single mother of five mischievous newborns; and Fang, a proud leader of the pride who must defend his family from a rival lion and his sons. 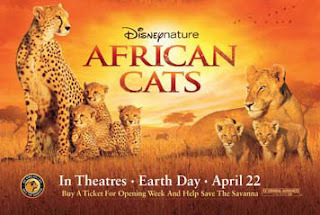 An awe-inspiring adventure blending family bonds with the power and cunning of the wild, “African Cats” leaps into theatres on Earth Day, April 22, 2011. As the April 22 opening of the awe-inspiring “African Cats” approaches, Disneynature is tapping into the true power of social media by building awareness of its “See ‘African Cats,’ Save the Savanna” program. During the film’s opening week (April 22-28), a portion of the proceeds from that week’s ticket sales will be donated to AWF through the Disney Worldwide Conservation Fund to protect the Amboseli Wildlife Corridor, a passage between the Amboseli, Tsavo West and Chyulu Hills National Parks that is frequently used by lions, cheetahs, elephants, zebras, giraffes and a host of other animals in the African savanna. 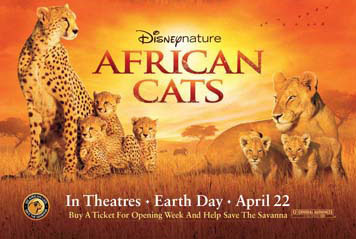 For more information about the movie and the “See ‘African Cats,’ Save the Savanna” initiative, check out Disney.com/AfricanCats. Win The Only WDWorld Giveaway! One winner will be randomly chosen from all valid entries that are received by 11:59 pm EST on Monday April 25, 2011. The winner must be a U.S. resident. Once a winner has been determined they will be contacted by Only WDWorld in order to get more information to ship the books to them. 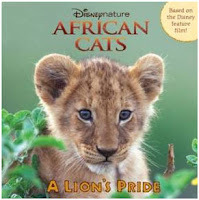 4 comments to "Disneynature African Cats Giveaway: Win 2 Disneynature Books"
I saw a commercial for this the other night, the footage looks unbelievable! I really want to go to Africa after I stayed in the Animal Kingdom Lodge last year. My daughter loves the lions! 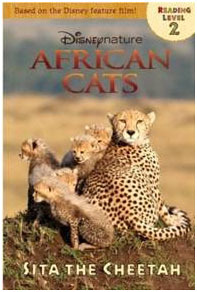 Congratulations to Nikki Putney of SC, who won the Only WDWorld / Disneynature "African Cats" Giveaway. Thank you to enveryone who entered the Giveaway at Only WDWorld.com and the Only WDWorld Facebook Page.